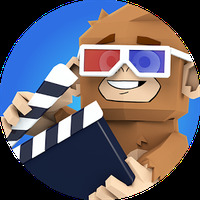 Toontastic 3D Android - Free Download Toontastic 3D App - Google Inc.
"Tell a story by creating your own cartoons!" Game Goal: Children can create their own stories and unleash your imagination because it allows them to play freely with all its elements. How to Play: It works like a small theater, choosing the characters and environments. Players can also record and add their voice to their stories. Graphics: As the name suggests, it has an aesthetically pleasing 3-dimensional design, which boasts full color and has smooth animations which include some very fun designs that will delight younger players. Game play: Besides having dozens of characters, scenes and songs that can lead to endless possibilities the game has a tool to create your own characters or add photographs to them. Developer: Google Inc. is based in United States	- Verified developer. Installation requirements: A minimum of 31M of free memory space and Android 5.0 or higher. Rating: The TOP 10 Most popular games in Interactive Games category. The sound quality could be better. Do you like Toontastic 3D? The best sketch & guess board game on your Android! A collection of fun and educational football games! Embark on the most fun vacation of your life! An enjoyable romance story full of mystery and secrets! You choose how the story ends!